Nelly Furtado was right when she ‘sang’ All Good Things Come to an End. 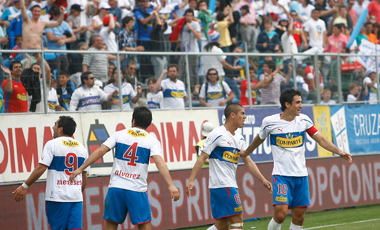 Barely three days after making history by winning nine consecutive league matches Universidad de Chile’s run had come to an end, just when it was looking like they would be unstoppable. Travelling to joint bottom of the league Santiago Wanderers, a tenth consecutive win was almost a given. But it wasn’t to be and could have been much worse after the home side took the lead early on and then Universidad were reduced to 10 men when Marcos González was sent-off in the second half after Francisco Castro had equalised in injury time of half-time. But neither team threatened to take all three points while Santiago goal scorer Orué saw red late on. There was only four minutes on the clock when Santiago Wanderers took the lead. 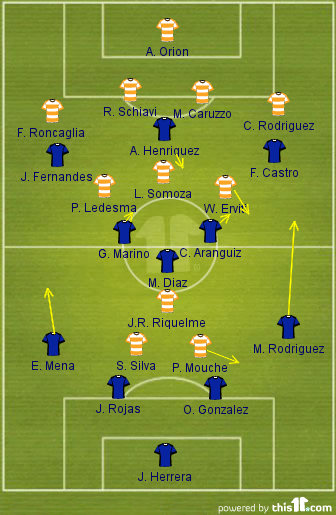 A free-kick was won just inside La U’s half; Sebastián Rusculleda’s inswinging left-footed delivery caused Los Azules defence to drop deep into their box and La U midfielder Albert Acevedo glanced a header against his own post with Herrera scrambling across to keep it out. The ball fell invitingly for Ángel Orué to knock home the rebound into the empty net from inside the six yard box as Herrera lay helpless on the ground. Universidad de Chile rounded off a splendid week with a comprehensive 3-0 home win against O’Higgins to continue their indomitable Clausura form, creating Chilean football history in the process. Sunday evening’s win saw La U set a new record, winning nine consecutive games; beating the previous record of eight wins in a row, achieved by Cobreloa back in 1978 and more recently Colo-Cole in 2007. 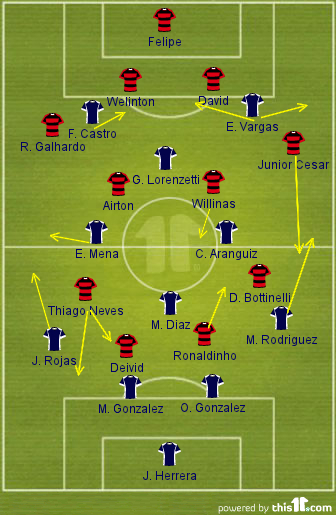 During the week La U had made the trip to Uruguay to play Nacional in the Copa Sudamericana where a confident first half performance led to a two goal half-time lead – 3-0 on aggregate – before an item thrown from the home crowd, striking a linesman, saw the game suspended and tie handed to the Chilean side; a tie with Ronaldinho’s Flamengo awaits in the last 16 of the tournament.